Today and yesterday I came across something new – a shoe carousel. Actually after some online research I discovered it’s called a shoe tree and it seems that you can pick one up at your local big box like Target or Bed Bath & Beyond. I’d never seen a circular shoe tree before so took note when I came across them in two different houses for sale. There was no missing them – each was loaded with shoes and on display in the bedroom. I may be on the squeamish side but have to say there is something totally unappealing about a fully loaded shoe tree. Piles of people’s well-worn shoes are typically not visually enticing. 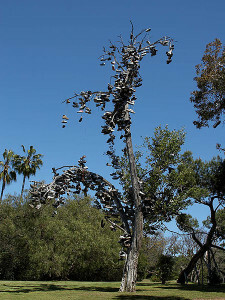 The shoe tree makes it worse since the soles face outwards. A carousel of dirty shoe bottoms – ugh. It’s ugly and, when displayed out in the open, an in-your-face announcement that there’s not enough room in your closets. The houses, priced more than a million dollars apart, had something else besides shoe trees in common. Each was a mess. In one case the house had been on the market for a couple of months. Sometimes home sellers get burnt out. Keeping the house show-ready for buyers is a drag, especially as the weeks wear on and the place starts to look a bit more lived-in. Our showing was short notice so I imagine that’s the homeowner’s excuse. The mess was so extreme, however, that a day or two’s notice wouldn’t have been enough. It was hard to fathom what the sellers were thinking, particularly since they were selling for less than they paid and had done renovations to boot. It was no way to sell a house. The other house was new to the market and while not as much of a disaster area was still messy, cluttered, and just generally unkempt. And there was that shoe tree. It’s impossible to quantify how much money the seller will leave on the table by not making the extra effort to be show ready before opening the doors to real estate agents and buyers. But there’s no doubt that there’s money to be made by applying some spit and polish before your house debuts on the market. Kudos to you if you already live in a place that looks like a model home. But for the rest of us you’re really best served by clearing out and cleaning up before you have the first agent in, never mind the first buyer. A good real estate agent will be able to help you with the fine tuning and can make suggestions about furniture or accessories to remove or even add. And take it from me – if your home is for sale the shoe tree’s gotta go. This entry was posted on Tuesday, October 1st, 2013 at 3:38 pm	and is filed under Seller Info. You can follow any responses to this entry through the RSS 2.0 feed. You can leave a response, or trackback from your own site.